When I cook this “Rajas de Chile Poblano” (Poblano pepper strips in a creamy sauce), I can’t stop eating them. That’s why I try to make it less often even if It is so yummy. Just a few ingredients and the cream do wonders shooting the spiciness of the Poblano pepper. Even before I start cooking my mouth starts watering, and then the thought that potatoes will be added (because my son will also eat them), makes it even merrier. Imagine potatoes and cream together in a taco, Delicious! After completing this step place in a plastic bag or cover with a kitchen towel and let them sweat with their steam for about 15 minutes to loosen up their skin. After sweating the peppers the skin will come off easily. Using a knife or with your finger make a slit and remove the core with the seeds and the veins using a knife or your hand. Clean with your hands or with a paper towel. Many recipes indicate to clean the peppers under running water but doing that you take away the delicious roasted flavor. Add the garlic if using cook for about 2 minutes. After that you are ready to stir in the Poblano strips. Keep cooking 2 more minutes. When I cook this “Rajas de Chile Poblano” (Poblano pepper strips in a creamy sauce), I can’t stop eating them. That’s why I try to make it less often even if It is so yummy. Just a few ingredients and the cream do wonders soothing the spiciness of the Roasted Poblano pepper. A quick and easy recipe. Place the cleaned peppers directly onto the flame of the burner. You can also roast the peppers under a broiler. Let the skin char slightly making sure you turn them to have an even roasted of the skin. (Since I was taking the pictures, mine were getting too char). Variations to this dish: There are many variations to this dish some include adding cooked chicken breast strips, fresh cheese strips, potatoes,etc. There are days when I crave peppers and onions, this sounds perfect. Mely, qué rico! La primera vez que comí estas rajas con crema y papita fue en el D F En la calle, en una zapatería llegó una señora vendiendo tacos calientitos, traía tacos de arroz, y de varios guisos, en porta viandas, todo cargado en bolsas de mandado de colores. Deliciosos! Mis preferidos, los de arroz y los de rajas. Love this site. And I cook too! I want to follow along, and invite you to follow mine as well. 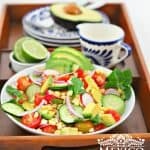 Mely, la receta del pan de chile poblano la subió Gaby, yo nada más la enlacé, buscala allá con ella está bien explicadita y linda como siempre, yo sólo subí los panes y puse la receta de una hamburguesa deliciosa de tofu. I love poblanos and this sounds so good. I like the idea of potatoes in them and think it would be a great breakfast! wow mely this look soo delicious i was laughing at your chiles in the zip baggy bcus my mom always makes me put them in old grocery plastic bags i never understood why but now that im older i do 🙂 haha. but this looks good to serve like with the potatoes 😉 reminds me of when i cook nopales al carbon for my carne asada! i love nopales 🙂 im going to make this maybe tonight 🙂 bcus in my house no dura para nada la crema.. im happy that i am mexican an that im young an know how to cook things from scratch not de lata or de bote or frozen i can make real mexican food 🙂 fresh agauas de horchata and de frutas y comida echa bien buena me da una confidence and love for my country ya que ay muchas muchachas jovenes pues que an dejado o no sienten la importancia de aprender. tengo una prima que tiene 14anos y tiene 5 anos viviendo aqui en tejas que se vino del otro lado y no siente la importancia de aprender estas cosas me duele el corazon pero me gusta la cosina 🙂 y gracias a ti hases mi vida y famila y mi pansita feliz! Thank you so much for posting this recipe. Over Christmas time my wife and I headed to the local Mexican store to pick up ingredients for Tamales. The owner graciously let us taste his lunch which was this recipe. I am making this tonight, I can't wait to taste it again. I hope you like them. Thank your comment. Si se puede usar sour cream? 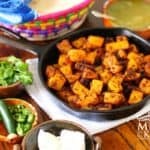 si no encuentras la crema mexicana, puedes usar varias opciones como crema agria (sour cream), queso crema o heavy cream como substituto. Neat idea. I hope I find some poblanos soon. BTW, wouldn't it taste different to broil them than to burn the skins on the heat? I have a flat-top stove top, but I can use my BBQ grill's side burner to do the burning. You can do that in your grill. I hope you enjoy as much as we do. I just saw this recipe on Pinterest, Mely, and it sounds SO good! I'm going to make it with the potatoes… and some kind of meat because according to hubby, it isn't a meal unless there's meat in it! Ha! Thanks for a great recipe!